Would you recommend this book for fans of the first? Yes! Review In A Nutshell: Daughter of the Siren Queen was a perfect conclusion to an amazing duology! Daughter of the Pirate King followed Alosa, a ruthless pirate loyal only to her father and her crew. After the events of the first book, I was eager to see what Alosa would do next. One of the things I loved most about book one was how unpredictable she was as a character, and she definitely continued to surprise me in the sequel. I was also eager to delve further into the relationship between her and Riden, as well as learn more about all of her crew. Daughter of the Siren Queen did not disappoint on either aspect. It continued to develop our main characters and further built a fascinating a magical world. 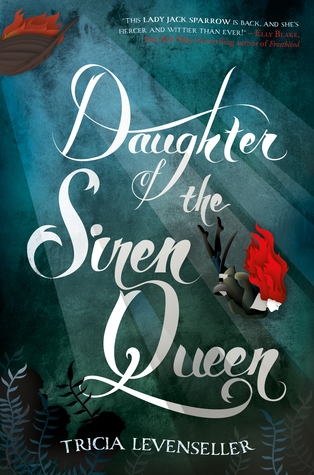 The plot of Daughter of the Siren Queen kept the fast pace that I loved in the first book, filled with even more action and adventure, while still keeping to a sense of a reality and truth. The characters had a lot to work through, and even more inner conflicts arise during the course of this book, leading them to grow and change even more. There were many new characters introduced, creating a more diverse cast in terms of race and sexuality (something I was very glad to see).The writing style maintained a great balance of humor, romance, heart, and action.This was one of the most fun and gripping books I’ve read in awhile, I had to fight with myself in order to actually get some sleep in between reading. This was a perfect sequel and finale, and I can’t wait to see what Tricia Levenseller will create next. Pros – The characters, writing style, and setting was just as great as the first, and even better in some instances. Cons – Sometimes the pace felt a little too fast? Daughter of the Siren Queen was everything I hoped it could be and more.